It's rare these days that I get to knit something from someone else's pattern, but whenever I do, it's such a joy that I kick myself for not doing it more often. 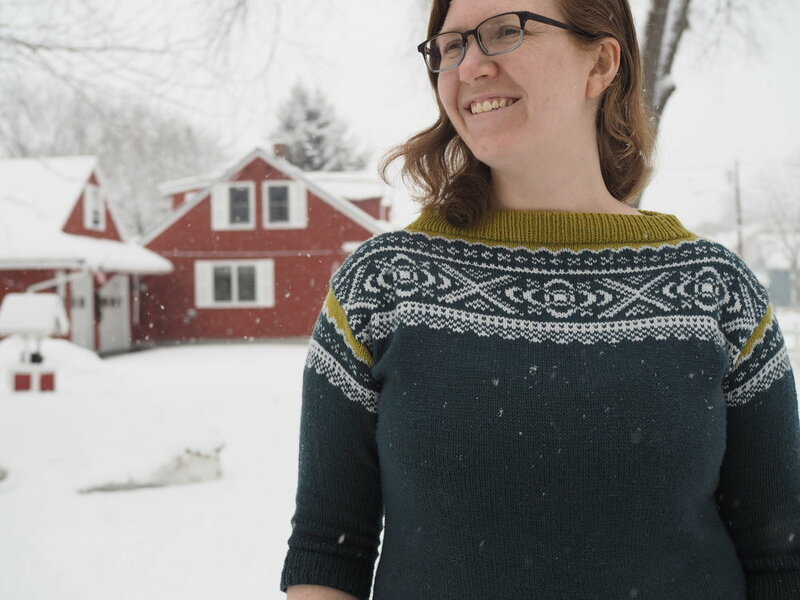 Case in point, my most recently finished knit - the Ebba pullover by Diana Walla. I had eyed the pattern back when it came out in September 2015 (how time flies!) and then I had some time this winter with no knitting deadlines and thought- you know what, let's do it! So I went to my LYS - picked up some colors, swatched, went back to LYS to exchange a color when the first combo didn't work out, swatched again, cut my first steek, and then merrily knitted for a month. I completely enjoyed knitting this and I love the finished project. Wearing it twice a week until it's too warm is totally acceptable, right? But more than anything, I love that it re-triggered that colorwork-loving portion in my brain. Back in the day, I had a lot of fun designing some colorwork pieces like Zoetrope, but then for one reason or another, I stopped. But I'm inspired now, and I maybe bought a crazy amount of yarn because I do nothing in halves, apparently, so more colorwork to come! !